Hi there! 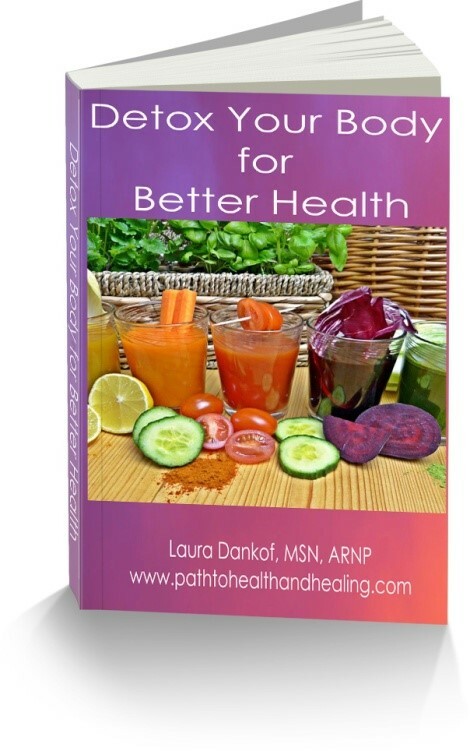 I’m Laura Dankof, the founder of Path to Health and Healing. My mission is to provide health information to empower you to take charge of your own health and transform your life. As a functional nurse practitioner I help people to heal their guts, and balance their hormones so that they can reclaim their health and vitality. I do this by meeting one-on-one via in person and virtual health consultations. To learn more about how I can help you, click here. I likely don’t have to tell you that health care today is a big corporate business that has lost its way. The art of healing has been lost in a mire of regulations and pharmaceutical influence. It is time to remember that health and healing is about addressing the whole person. This includes all aspects of the individual by addressing their physical, mental, emotional and spiritual needs. You health is not about simply taking a pill or fitting into a one size fits all protocol. As a functional practitioner I will work with you as part of your health care team and individualize your care to meet your speak health needs and goals. As a functional medicine and holistic nurse practitioner, I have over 30 years experience working in health care system. I have helped thousands get to the root cause of their symptoms. I am also a speaker, and author of “Seeds 4 Change: A Path to Health and Healing” and “Gluten-Free Lifestyle: Your Guide to Gluten Freedom“. My journey began like so many other functional and holistic health practitioners. I saw the shortcomings within the conventional health care model when it came to my own health and also that of my loved ones. This lead me on a journey to find answers as to WHY things happen, and HOW do we fix it. Don’t you want to know why you have a hormone imbalances, fatigue, digestive issues, food sensitivities, depression, joint pain, or why you have developed various other diseases? Don’t you want to figure out how to improve your health, or better yet, prevent disease from happening in the first place? Conventional medicine is great at acute care, but is lacking when it comes to managing chronic disease. Taking a handful of pills to mange symptoms is not the answer. Getting to the “ROOT CAUSE” is the answer to solving the health care crisis. Are you struggling with a health challenge and searching for a practitioner that will listen? I know what it is like not to be heard. You see, my youngest daughter was born with a congenital blood disorder and was very sick the first 7 years of her life. At first the doctors did not know what was wrong. Unfortunately her diagnosis was initially missed. As a parent it was agonizing to watch. I felt so helpless. Eventually her diagnosis of congenital spherocytosis was made. She was chronically anemic. Then the worst that can happen to someone with this condition is to contract Parvo-virus or Fifth Disease, which she did. Her bone marrow production shut down. I spent a week in the hospital with her in isolation as she received blood tranfusions and her condition could be stabilized. Two years after this incident she began having gall bladder attacks. You see the constant breakdown of her red blood cells caused gall stones to form. One night she had a severe attack and became jaundice. Enough was enough! The time had come for the only treatment for this condition and that was the removal of her spleen and her diseased gall bladder. She was only 7 years old! As a parent, it just tore my heart out to watch this. She was very strong though. It was like this little 7 year old child was being strong for her parents. She was so brave and never complained, not even with all the blood draws. She was telling the nurses where to poke. She made it through the surgery and became healthy finally. Her color was no longer gaunt and pale. She had pink cheeks for the first time in her life. The down side of having her spleen removed is that her immune system was compromised. The hematologist told us she had to take penicillin (an antibiotic) every day until she was 21 years old! This was just in case she got a bacterial infection. Since she did not have a spleen she could not easily fight off infections. Life was moving along, then about 4 years later, after taking this antibiotic every day, our beautiful daughter developed eczema, and worsening allergies. My instinct at that time, having a bit more medical knowledge, was that the antibiotics were now making her ill in another way. The antibiotics were causing yeast overgrowth. The doctors treated her first with steroids. This made things worse. I thought, if this is yeast, why are we using a steroid? Does that not promote yeast? Then the dermatologist wanted to put her on an immunosuppressant drug. Why would you want to put a child that is already immunosuppressed on this? I had also read this drug could cause cancer. I said to the dermatologist, if this is yeast, why can’t we use an anti-fungal? He dismissed me. I stopped her antibiotics, called my sister-inlaw, who worked with a holistic chiropractor. I detoxed her body with homeopathy and her skin cleared up and her allergies improved. I told the hematologist that I had stopped her antibiotics and he was livid. He told me I was going to kill her, in front of her! We never went back. I consulted another hematologist and she stated that it was no longer recommended to give an antibiotic more than 2 years after the spleen was removed. Life went on, she grew into a healthy, active young woman. Then while in college she began to have repeated sinus infections and headaches. Having now ventured into the world of natural and functional medicine with her years earlier, my first thought was that the antibiotics she had years prior where now a factor causing her current health issue. I suspected she had a food sensitivity to gluten and possibly other foods. She initially did not listen. Finally after suffering through college of which the diet consists of a lot of gluten containing foods such as pizza and beer, she listened. She felt so bad and did not want to see another doctor. Guess what happened? Once she took the gluten out of her diet, her sinus congestion and headaches went away. All those years of antibiotics not only caused her to develop eczema, but now food sensitivities. Doctors did not believe me, so as a protective mother; I took matters into my own hands to help her to heal, not once, but several times. What I realized through all of this is the gut is the epicenter to good health and is a key player in getting to the root cause. Heal the gut and the rest will follow. All those years of doctors not listening, patronizing and dismissing my suspicions made me angry and frustrated. I also felt like I was failing to protect my child. The turning point and venture into natural and functional medicine began that day in the dermatologist’s office when he was asking me to put my daughter on an immunosuppressant drug. That he had no concept that the years of antibiotics were causing the yeast overgrowth on her skin. I lost faith that he would be able to help her. It was at that time I knew conventional medicine was not going to help my daughter. Then, as I worked to help her heal, I began to have my own health challenge. I was under a lot of stress from years of her being ill, working full time, going to graduate school and then starting to practice as a nurse practitioner. My hormones were out of whack. I was tired, gaining weight, my menstrual periods were irregular and extremely heavy and I had developed cysts in my breasts. My diet was not good. How was I now going to help myself and be a role model for my children and my patients? I did not want to fall into the pill for every ill trap. Instead I looked within and determined how my stress and diet were having an impact on my health and hormone balance. Given the personal events, I delved further into the world of functional medicine at this point to try and figure out how to help myself and was on a mission to help other as well. From here I started doing functional diagnostic testing. I began asking my patients their story – past and present that lead up to their health problems. From there I was able to individualize a plan to help my patients on their path to health and healing. Not a cookie cutter protocol. Through healthy nutrition, stress reducing techniques, exercise, and using supplements and homeopathy people were getting results. They were getting better and often times the symptoms they had been troubled with going from doctor to doctor with – had now disappeared. They had the solution to healing their body. My frustrations about the health care system were now met with hope. Hope that there was a better way to helping so many people that were suffering. Seeing their suffering end and to have their symptoms validated was such a relief. They found someone that would listen and could offer them hope. As a functional medicine nurse practitioner I have applied what I have learned and have helped thousands of people to this day, get to the root cause of their health challenges and begin to heal. The health journey that my daughter and I went through totally changed my life and hers. It made me see the good and the bad of conventional medicine. It opened my eyes to what other health modalities such as functional, natural, and integrative medicine have to offer. Best of all, today my daughter is a healthy young woman. By addressing her food sensitivities she no longer has the sinus congestion, headaches, and fatigue she was plagued with. She no longer has eczema. She is happy and full of life. My health also improved. The hormone imbalances improved. The breast cysts went away. I went into menopause with ease and my weight has been stable. The personal transformation in our lives ignited my passion to help others. One of the key things I have learned through all of this is; getting to the “ROOT CAUSE” is the answer to solving the health care crisis. Functional medicine has not only help transform our lives but also all the patients I have treated over the years. It is time to raise the health consciousness, only then will we see the chronic disease tidal wave recede. Only then will we turn the tide on the health care crisis and people’s suffering. Each of us has our own healing journey. Sometimes we just need a little help and the right tools to find our Path to Health and Healing. The best reward is hearing how you helped someone to sleep better, have more energy, see their digestive issues resolve, getting relief from their hot flashes and more. Have you been left frustrated with a health challenge and are not getting answers or have been told there is nothing wrong like I was? If so, it may be time to seek out the help of a functional medicine practitioner like myself. To learn more about how I can help, simply click here.